Quality construction and materials meets questionable design and some key omissions on the technology front. A great display and the latest software aren't quite enough to save this luxury smartwatch. Android Wear started life in technology companies like LG and Samsung, before it spread its wings and convinced a wider range of brands that this Android-based platform was the ideal way for them to take a slice of the fledgling smartwatch sector. That's seen diversification, bringing more manufacturers from the likes of Fossil (along with its army of fashion brands), Casio and Polar, all looking to add features that were previously only obtainable with a lot of software development. On the whole this has been a good thing: fashion brands add appeal to watches; sports brands add experience to make them great for specific tasks – and we've seen some great watches as a result. That brings us to the Montblanc Summit. But what exactly does this smartwatch bring to the party? Tracing a line through the history of Android Wear, generally speaking the fashion watches have delivered a better design than those from technology companies. Fossil's experience in making watches (for brands like Michael Kors) has resulted in watches that wear well. The same can be said for the Tag Heuer Connected 45: you can feel the watchmaking experience in its smartwatch. Sure, some will that watch is too big, but it feels great to wear. It's here that the Montblanc Summit stumbles a little: it's not the nicest watch to wear. Some of this will come down to personal taste in what you want from a watch, so it is subjective, but even on our averagely-sized man wrists, we find that the lugs are just a little too far out from the body. Unless you've got big wrists, this watch won't wear well. In many ways, the design reminds us of the LG Watch Urbane. We aimed the same criticism at that watch, that it never really sat right for us, although Montblanc delivers in ways that LG's watch never did, namely in its use of quality materials. The body of the Summit can be either stainless steel or titanium, with our review sample coated in black PVD. There's a good heft to it, so it feels like a quality watch. It offers protection from water and dust, too, thanks to its IP68 rating, so there's no need to to worry about washing up or getting caught in a downpour. That's all paired with a quality straps too. The black calf leather strap is a highlight, something that gets better with wear as it relaxes and gets increasingly supple, although we still maintain that the lugs should draw the strap closer to the watch's body to make it sit better on the wrist. There are no markings on the bezel, that's left for the rear of the watch where the optical heart-rate sensor sits in a plastic back. This sensor is raised slightly to give better contact with the skin, a common feature on smartwatches. Finally, there's a crown at the three o'clock position, with a button in the centre. Sadly, the crown does nothing at all, it's just decoration to present the button. With Android Wear supporting rotational input – something supported by the LG Watch Sport – it's surprising that on this £800 watch that crown is simply a decorative bauble. On the hardware front the Summit's load-out is fairly familiar to other smartwatches. The device is powered by the Qualcomm Snapdragon Wear platform, there's 4GB of storage so you can add your music and connect to Bluetooth headphones without the need for your phone, and there's Wi-Fi that will allow the watch to connect to known networks and keep you updated when your phone is elsewhere. One recent development missing is NFC, so mobile payments are not possible, which leaves it a little behind the curve. Like that decorative crown, the omission of these features make the Summit feel like it was designed for older software; like it's already out of date. The heart-rate sensor on the rear of the watch will provide pulse data to applications like Google Fit. However, the bundling of Runtastic suggests that Montblanc thinks you'll be using this watch as a fitness device - which we doubt, given the lack of GPS meaning the Summit isn't best suited to that task. The heart-rate sensor works pretty well: we found it would accurately deliver resting heart rate, but it's not as capable as some of the best sports devices when out on a run, so we can't recommend you choose the Summit over something like a TomTom Spark or a Garmin Forerunner if sport is a primary requirement. The display on the Summit is one of its highlights. It's topped with sapphire crystal glass to ward off scratches, and its slight dome shape means it's great to look at. The high 400 x 400 pixel resolution means it's nice and sharp too, with plenty of punch to colours. It doesn't quite hit the pixel density of the LG Watch Sport, but for quality alone, we've little to complain about on the display. Android Wear 2.0 is the latest version of Google's smartwatch software and is now widely available across the majority of recent devices. Android Wear 2.0 gives the watch more independence, letting you install apps directly on the watch, rather than having to go via the phone on every occasion. These apps will also often run without the need for the phone to be connected, although obviously if an app needs external data, you'll need to be connected to something to allow that. That situation is the same as most of the other Android Wear devices out there and, generally speaking, there aren't huge changes to this arrangement across devices. Running Citymapper on the Montblanc Summit is very much the same as it is on the Huawei Watch 2, for example. The unique elements come in the form of watch faces, giving you a few classic Montblanc analogue faces (in digital form, of course), with the ability to make a range of customisations to the complications. If you want the chronograph to show your steps, that's no problem. Our favourite is the so-called "sports watch face" which has a series of bars arranged like the Montblanc mountain logo, each filling to keep track of your activity through the day. It's a little like the circles of the Apple Watch and adds a little colour and fun to the display of this watch. Runtastic, Uber and Foursquare are pre-installed (which isn't a huge deal as you can install them from Google Play anyway) and there's a world clock to help you stay in correct time zones as you travel. There's a 300mAh battery in the Montblanc Summit. This isn't the largest capacity in this type of device and so you can predict the performance to a degree: it doesn't have the greatest stamina either. Typically, we found that the Montblanc Summit will just about get through the day, although it will be dead by the next morning. That makes this a charge daily device. If you're using it for exercise then battery drain is heavier: a 30 minute run will mean that the watch is likely to be dead by late afternoon. That amounts to battery life that's far from ideal and outpaced by rivals that cost a fraction of the price, which are now offering closer to two days of life. About the only positive of the battery situation is that the Summit charges fully in little over an hour. So, if you're serious about wearing the Summit out in the evening, you'll want to pop it on the charger before you head out on the town. The Montblanc Summit sees another big name join the Android Wear party with a smartwatch of its own. That's always welcome, but from a technology and experience point of view, the Summit does nothing to move the Android Wear story forward. The Tag Heuer Connected might cost considerably more than the Summit, but it offers a much wider range of options, better performance and a better overall experience. Go the other way down the price bracket and you'll find the Huawei Watch 2, which is about a third of the Summit's price, but offers more. Sure, the Huawei doesn't offer the same high quality of materials, but it performs better as a piece of technology and at least brings the latest hardware with it. But brands aren't always about technology, they are about design, quality and style. 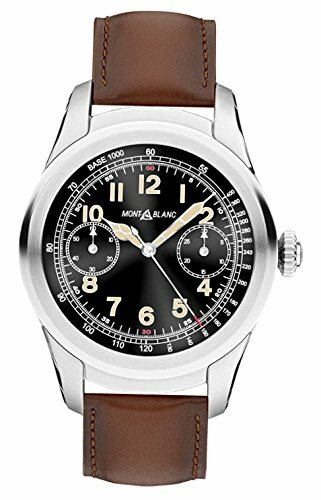 The Montblanc Summit undoubtedly is a quality watch. From the leather of the strap to the weight of the body and that domed sapphire crystal glass, this is a quality product that meets the expectations of a brand like Montblanc. At the same time, we're not convinced that it's the best design of watch; it just doesn't wear as well as others and the decorative crown is something of a disappointment. For us, the Montblanc Summit falls short of greatness. It's an £875 watch that needs to sell itself on brand and little else. If it's Swiss watchmaking that you're after, then the Tag Heuer Connected Modular 45 is where you want to go. This is more expensive than the Montblanc Summit, but it's also more accomplished. You have much wider freedom of choice when it comes to design and customisation and an experience that's much better overall. We think it looks better and wears better too. If you're looking to correct the technology deficit in the Montblanc Summit, then the Huawei Watch 2 may well do it. Opt for the LTE version and you've got one of the most connected watches available with a wide range of functionality that the Summit can't reach. It isn't the same quality and the material could be better, but it's a fraction of the price and might better sate your smartwatch cravings.